Nature's Way Kelp is a nutritionally-rich seaweed. This particular species grows in deep ocean water away from heavy metals and toxins. Nature's Way uses whole dried plant guaranteed to contain 0.06% iodine. Directions: Adults take 1 capsule daily, preferably with food. Has helped with multiple symptoms caused by thyroid deficiency. No bad after taste, doesnt bother my stomach if taken without food. Good clean product will continue to use it. The supplement is just a kelp powder, as per the label. No magnesium stearate makes it attractive to me. I keep in re-purchasing it for a number of years hoping it supports my thyroid function. So far so good. No unpleasant after-taste or repeating. 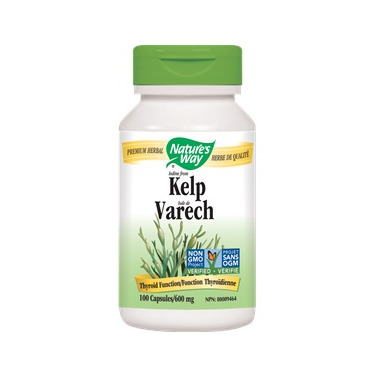 It was recommended I take Kelp tablets for thyroid health. I will likely order this one again.